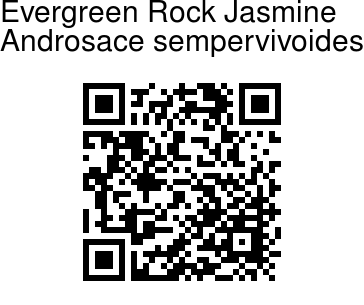 Evergreen Rock Jasmine is a perennial herb which grows on mountain slopes of Western Himalayas, at altitudes of 3000-4000 m. The species name sempervivoides means, appearing to be ever alive. This flower is distinguished by by its relatively large compact rosettes of leaves, 1.5-2.5 cm across, borne at the ends of spreading branches. Leaves are either inverted-egg shaped or spoon shaped. 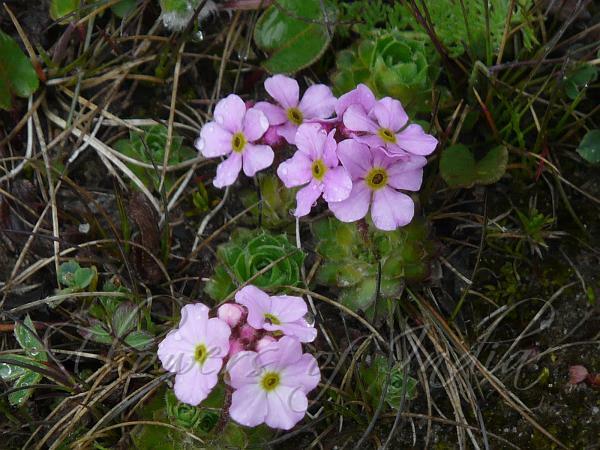 Flowers are pink, 8-10 mm across, with a yellow or orange eye at the center. Flowers occur in compact umbels on flowering branches. Bracts are narrow elliptic, hairy. Leaves occur in rosettes, 1-2.5 cm across. The plant is characterized by reddish runners. Flowering: June-August. Identification credit: Dinesh Valke Photographed at Rohtang Pass, HP & Valley of Flowers, Uttarakhand.